No one is safe when those who deal in power play at war. 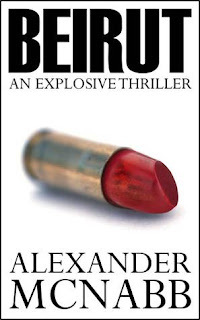 In Alexander McNabb's novel, Beirut, the characters face down a deadly game of Nuclear Risk. One false move and the greedy politician will have his warheads and start the end of the Middle East. The main character of the novel, Gerald Lynch (who hates being called Gerry) is a British Intelligence Officer who lives in Beirut. When he discovers that Michel Freij is running for president, he knows that it isn't good for the country of Lebanon. Lynch is the character who demands the respect and sympathy of readers. He's the character left behind when those around him are suffering and disappearing. Lynch is loyal, trustworthy, and puts others before himself. Readers will bond with Lynch based on his desire to avenge his friends lost to the makings of war and his prideful personality which allows him to follow his gut. When he knows what needs to be done, Lynch is the man who does it without hesitation. The supporting characters each have their own line of sub-plot, but some of them don't stay around long enough for a stronger bond to form. When I say that no character is safe, I mean exactly that. Parts of this novel are a bit grotesque and detailed, but the plot demands the reality of undercover operations. As a reader who avoids books about war and death, I found Beirut thrilling and suspenseful. I've never read a book like this before, and Beirut was definitely the one I'm glad I started with. It grabbed my attention and kept the suspense rolling right up to the last word. Recommended.